HomeDr. ZCongratulations to Dr. Z for being named a Delaware Top Doc for 2018! 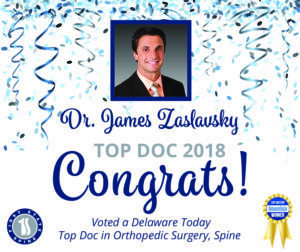 Join us in congratulating Dr. Z on being voted a Delaware Top Doc for 2018! Focused on helping patients achieve the highest level of function in the least invasive way, Dr. Zaslavsky received the top number of votes in his category. We are proud of our two-time winning Top Doc!